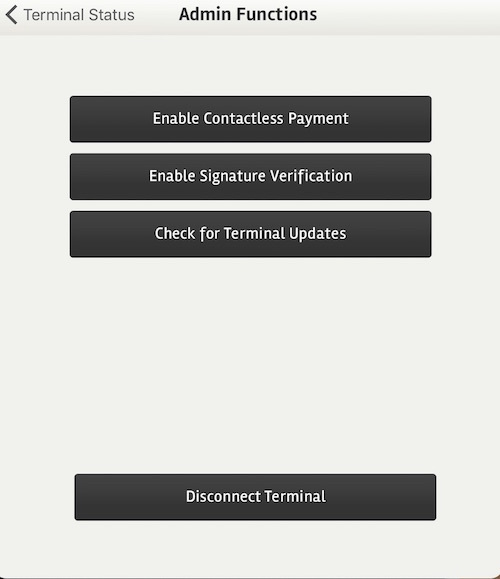 Here you can enable or disable the contactless payment functionality (otherwise referred to as paywave or tap and go). Contactless payment will be disabled to begin. Simply press the button to enable, press again to disable. Use this to enable or disable signature verification for payments requiring a signature. When verification is enabled, a 4-digit manager PIN is required to process the payment after the signature is entered. To Disable, simply press the Disable Signature Verification button. Terminal updates - updates of the BNZ PayClip software can be manually checked for and managed here. We recommend a daily check in the morning. 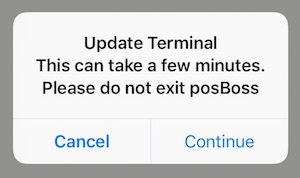 To check, press the Check for Terminal Updates button. If this is your first time logging on, make sure you do this now as the initial update can take a while. Press Continue on the pop-up window. If an update is available the next screen appears. Press Update Now and the process will begin. This can take a minute or so to complete. Once complete, you will receive an Update Completed message. Pressing this button immediately disconnects the BNZ PayClip from posBoss so no integration occurs. To re-integrate, hit the connect button and go through the login process.